In preparation for painting the wedding commission, I worked up a quick oil study to plan the composition, basic color scheme, and to see if I could loosen up enough to pull off this commission. The study sketch was enough to get me going, and once I was going, I couldn't stop painting. Contact me to commission an original painting. 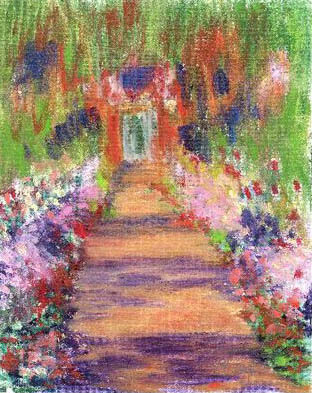 Commissioned as a gift for a bride who loved and appreciated the artwork of Monet, my painting of Monet's garden at Giverny places the bride and groom on the garden path. Painting this commission was such a joy for me. Love was in the air ... and in the painting. I was privileged to personally unveil and present the painting at the wedding reception. 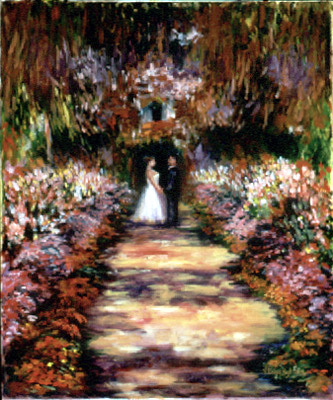 The bride and groom were surprised and touched by the gift of the Giverny painting, and I was touched by the numbers of guests who stood in line to view my painting. 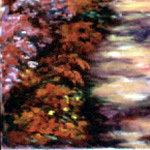 The bride and groom were painted based on individual photographs provided by the bride's aunt. Only one photo featured the bride in her wedding gown. The groom was in jeans or casual clothes in his photos. I faced the dual challenge of positioning the couple in the painting but also placing them in their wedding clothes. 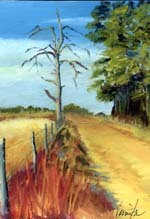 oil on canvas panel 8"x10"